I’ve seen a fair number of wireless HDMI devices, and most of them are short-range solutions because they use the 60GHz spectrum. Iogear’s Wireless 5x2 HD Matrix goes one better because it uses the 5GHz spectrum and its signal can penetrate a few walls—making it more ideal for actual home usage. With the 60GHz systems I’ve seen, the transmitter and receiver must be in the same room. That’s fine for wirelessly streaming video from your Blu-ray player to your video projector, but it’s useless when you want to stream video from a device in the living room to a TV in the kitchen. IOGear’s HD Matrix, which is based on the WHDI (Wireless Home Digital Interface) standard, can handle both those missions. What’s more, it can also send control signals from its receiver back to the devices plugged into its transmitter. The Wireless 5x2 HD Matrix can switch between HDMI sources and one component video source, sending their output to a single receiver. 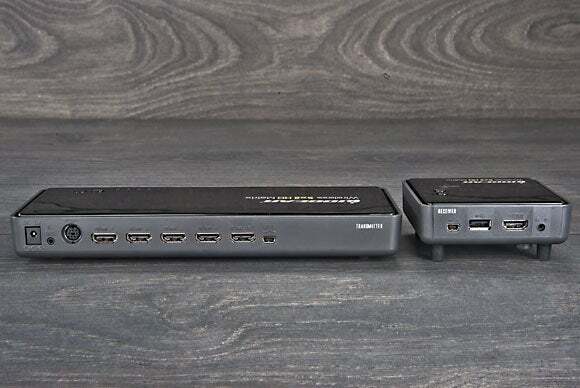 The 5x2 in the product’s name indicates that the transmitter has five inputs (four HDMI and one analog component video plus stereo) and two outputs (one wired HDMI and one wireless HDMI). You plug the wired output into a nearby TV and send the wireless signal to the receiver connected to a TV in another room. The receiver has a single HDMI out. One of the HD Matrix’s cooler features is that the transmitter and the receiver can switch sources independently: A TV plugged into the receiver can play video from the Blu-ray player, while the TV connected to the transmitter plays video from a cable- or satellite-TV set-top box, for instance. It’s a whole lot cheaper than hiring an installer to run HDMI cable through your walls and ceiling. The receiver has an input jack for an infrared receiver and a USB port for a mouse or keyboard. The transmitter has an output jack for an IR emitter and a USB port that you connect to a PC. This configuration allows you to remotely control a PC and up to five devices in your entertainment center (a Blu-ray player, A/V receiver, set-top box, or whatever else you might have). Iogearear supplies both the IR receiver and emitters on cables, so that the HD Matrix transmitter and receiver can be located out of sight. Two IR remotes are also included in the kit (one for the transmitter, one for the receiver). The remote is used to switch between sources and transmitters (up to four transmitters can operate at the same time, but only one receiver), display information about the incoming signal, and to power the HD Matrix modules on and off. You’ll want to provide your own universal remote control to use at the receiver end, because keeping track of remotes is hard enough when they’re limited to one room. The HD Matrix sends uncompressed video from source devices at their native resolution (ranging from 480i analog to 1080p digital), and it supports refresh rates of both 60- and 24Hz. The system is also compatible with all the CEA 3D video formats (top-and-bottom, side-by-side, and frame packing). It can stream two-channel PCM audio at 16- or 24-bit resolution at sampling rates of 32-, 44.1-, 48-, or 96kHz. Unfortunately, HDMI is the only way to get digital audio signals into the transmitter and out of the receiver. The presence of optical or coaxial inputs and outputs would render the HD Matrix a great high-resolution audio-streaming system, too. The device’s digital surround sound capabilities are also limited: You get only Dolby AC3 or DTS, because the system doesn’t have the bandwidth to stream high-resolution Dolby TrueHD or DTS-HD Master Audio soundtracks. Iogear says the HD Matrix delivers maximum range of 100 feet, but the number of barriers between the transmitter and the receiver will take their toll. I mapped out each room where I tested the system on a floor plan of the 2800-ssquare-foot home where I tested the system, indicating whether or not the receiver was able to sync to the transmitter. 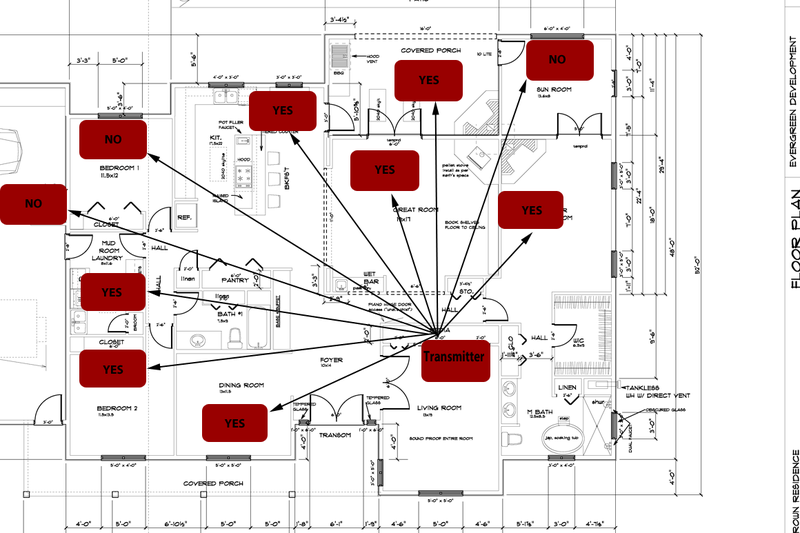 Although the floor plan doesn’t show it, the living room where the transmitter was located is a room-within-a-room design, meaning it has two sets of framing with dead air between them, and double layers of insulation and drywall. The intent of this design is to isolate the room from the rest of the house while improving its acoustic properties. It’s wonderful in that respect, but the density of the walls can play havoc with wireless devices. So I was impressed when the HD Matrix was able to stream to nearly every room. The three exceptions were my home office, one of the bedrooms, and the garage. The number of walls in between the transmitter and receiver were the primary culprit in the case of the bedroom and garage, and the trio of fireplaces with their metal flues near my home office likely accounted for that failure. The Iogear Wireless 5x2 HD Matrix is a little pricey at $400, but it’s a whole lot cheaper than hiring an installer to run HDMI cable through your walls and ceiling. I’m a little disappointed that it can’t stream an HD soundtrack, but I’m impressed with its performance, range, and ease of setup. And I’m very happy that Iogear thought to include remote control capabilities and includes the IR receiver and emitter cables with the device. If you need to stream HD video from one room to another, Iogear has a fantastic solution for you. It's a little expensive, but Iogear's Wireless 5x2 HD Matrix can reliably stream HD video from one room to another.